Mertwig's Maze (1988) is a Tom Wham design published by TSR. 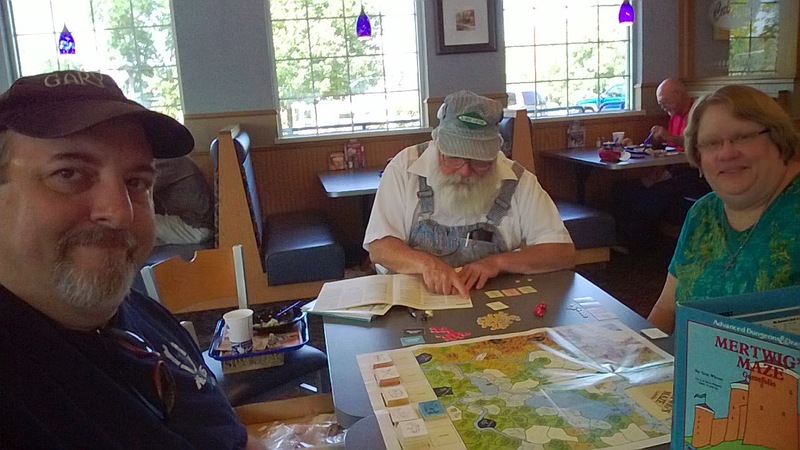 I got the chance to play this with Tom and our friend Wendy late last week. 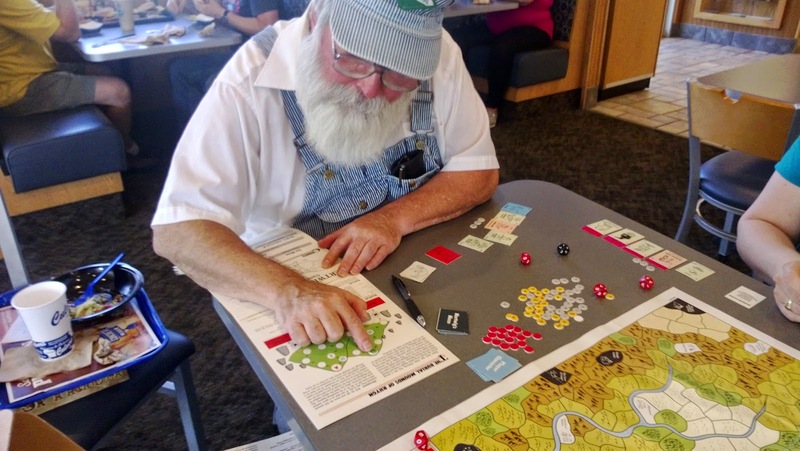 While it does have that old school roll the dice for movement mechanic, which can sometimes prove frustration, it also has some other very fun features. There are definitely RPG-influenced aspects of the game as well. Wise and beloved King Mertwig lays dying. His only children, a twin boy and girl, were stolen by gypsies long ago when they were still babies. Mertwig, desperate that his kingdom not fall into evil hands, announces a contest: Anyone who can present to him a Royal Treasure and a Royal Birthmark will be named heir! But treasures (not to mention birthmarks) are not exactly easy to find. And after a would-be Royal Heir tracks them both down, he (or she) must present them to King Mertwig - and that requires braving the dangers of Mertwig's Maze! 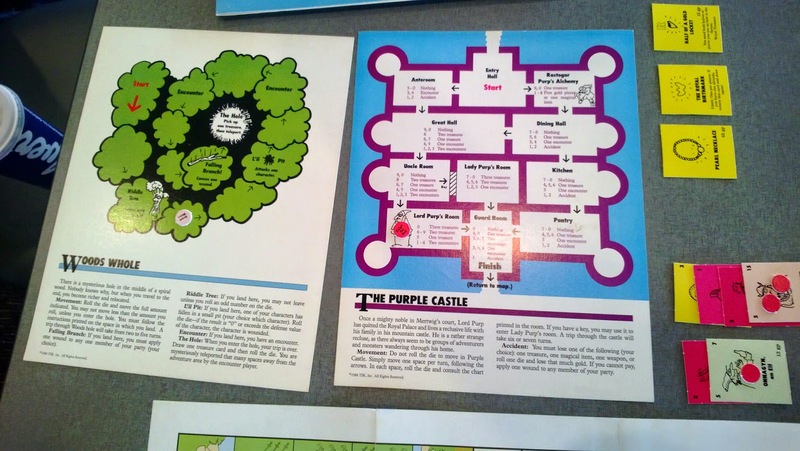 The Mertwig's Maze game is a lighthearted fantasy boardgame from Tom Wham, designer of numerous games published in Dragon magazine, including the classic Snit Smashing and Snit's Revenge. 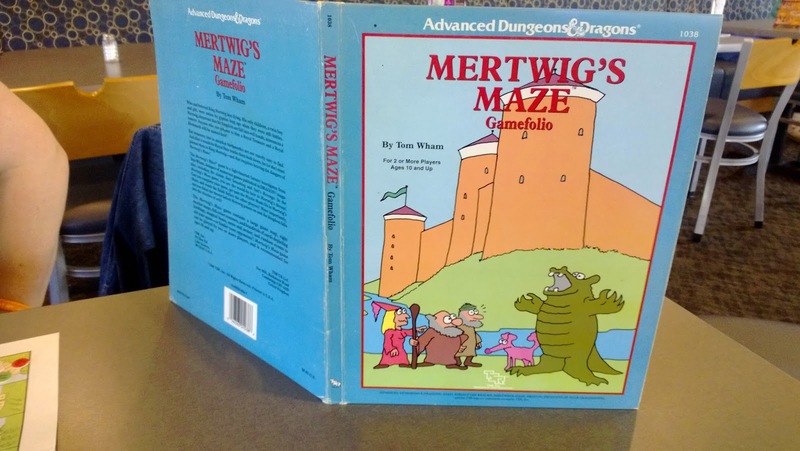 In the Mertwig's Maze game, you are the would-be heir to Mertwig's throne! Can you complete your quest, get past the Mystic Musk Ox in Mertwig's Maze, and reach the finish before the other players? More importantly, can you claim the throne before Mertwig passes on and the kingdom falls into the clutches of evil? 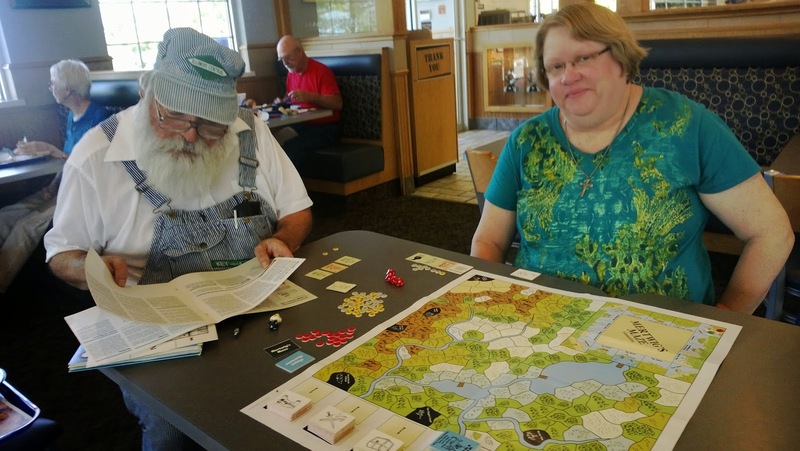 The Mertwig's Maze game contains a large game map, eight smaller maps, full-color counters, and hundreds of cards depicting hirelings, magical items, arms and armor, and random events to aid your quest - or hinder your opponents'! 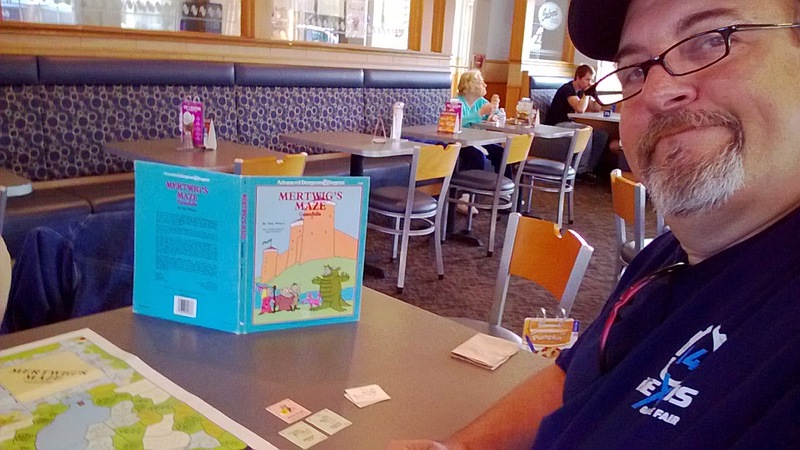 Mertwig's Maze game can be played by two or more players, and is recommended for ages 10 and up. The map is colorful and delightfully Tom Wham-ish, with all the little touches his artwork brings to his games. 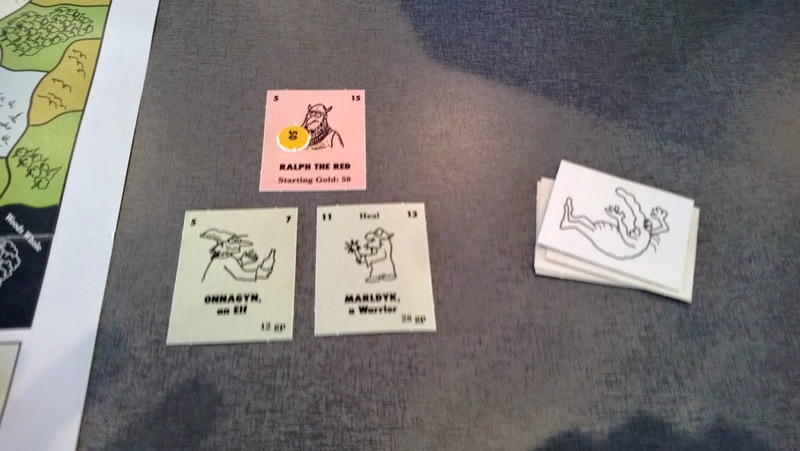 The Hireling cards are nifty and your main character as well as the Hirelings have Attack and Defense values that match up when you place the cards head to head for combat. Mundane and Magic Item cards slip beneath the characters and add to one or the other value. The various locations where your gathered party explore run the gamut of fantasy locations with tricks, traps, and monsters to overcome. Each location is unique, so there is not a lot of repetition in the game. We had a great time playing this classic and I look forward to tackling it again someday.